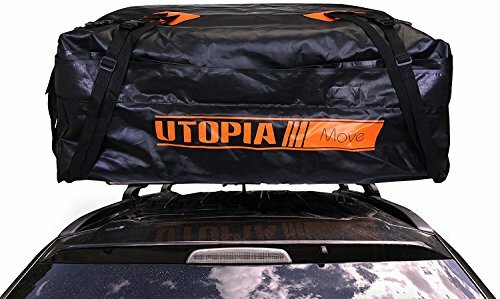 This Utopia rooftop cargo bag is an ideal pick for adventure seekers and families that are always on-the-go. It’s a great traveling partner that brings additional storage space along. Its waterproof design made with 500 D tarpaulin material adds great protection as it saves it from road grit, wind, rain and direct sun rays. Its heavy-duty construction lets you to easily carry essentials along without being worried about it getting damaged. It's soft-sided design further eases up the storage process. Each corner has two top quality PP webbing (eight in total for four corners) with a premium quality plastic buckle. It has five zipper pullers and a waterproof zipper closure. It folds up conveniently with minimal effort required. Its compact design allows you to store it with minimum space requirements. The storage bag comes with the pack for compactly storing the rooftop bag when it's not in use so that it can stay in perfect condition for longer in order to serve you best. Also, it’s recommended to keep the bag in the open air for some time after the product is received so that you can get rid of the odor that it carries initially.